This month Flip, our hero who seeks out local food recovery champions travelled to New Westminster to Aunt Leah’s Place. 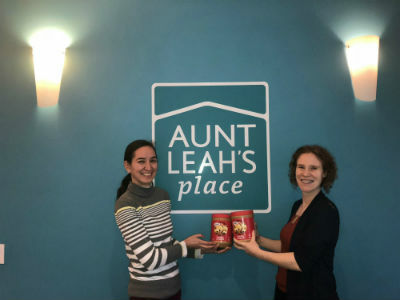 FoodMesh recently helped Aunt Leah's Place successfully reroute over 288 tubs of brand peanut butter to be shared among the community. Since then, recipe makers and chefs have gone to work on creating nutritious and tasty dishes infused with peanut butter. Aunt Leah’s Place has been serving Metro Vancouver over three decades by supporting youth in foster care and mothers on their journey to self-sufficiency.With the belief that every individual deserves to have a sense of belonging, they have worked to foster resilience and independence in young adults. One thing that brings everyone together is food. The experience of sharing food has enabled youth to feel more comfortable about sharing their stories and asking for help. A big part of Aunt Leah’s Place work involves coordinating food based programs such as Essential Skills and Cooking Club. The Essential Skills program offers valuable life skills through a variety of weekly workshops and a healthy meal is provided for everyone attending the workshop. Cooking Club is a 12-week program that helps young moms learn how to prepare tasty, nutritious meals on a budget.These programs require the availability of high-volume food; enough to be shared among all participants. Being able to provide a diverse range of quality food that can be shared among all community members has always been a priority for Aunt Leah’s Place. After 30 years of service, the community has grown immensely both in members and programs. To accommodate the growth, Aunt Leah’s Place started looking for ways to supplement their food procurement programs, to meet growing demands without sacrificing funds or quality. FoodMesh is a marketplace where charities, like Aunt Leah’s Place, have the ability to accept donations and purchase high quality food at a fraction of the cost. This year, the Essential Skills and Cooking Club will be making use of donated and recovered ingredients, including 288 tubs of peanut butter that were headed for compost. FoodMesh was able to connect the food with the right recipient, which saved over $2,000 worth of product and successfully diverted 576 kg of waste. FoodMesh’s commitment to customer-centric approach made the transaction easy. FoodMesh offers delivery options for both parties to choose their most convenient option when a match is made. Easy coordination of delivery meant the peanut butter tubs were delivered in no time. Peanut butter is high in protein and if taken in moderation can be a complementary protein source to the diet for those who may not have regular access to meat protein .Chefs and recipe-makers of the Essential Skills programs went to work crafting South-East Asian inspired dishes such as peanut satay or making classic peanut butter cookies, alternating the use of peanut butter as both main and side ingredient. Anything left over was sent home with clients and shared with partner organizations. What would have been wasted was used to save money, and feed more. The food recovery movement in the local community has been an amazing benefit to the organization. Aunt Leah’s Place has ongoing partnerships with the Dan’s Legacy Foundation and Refood. The Dan’s Legacy Foundation’s current surplus food recovery program collects and distributes in the community approximately $70,000 worth of food each month, ensuring that more than 400 people, including Aunt Leah’s clients, have their basic food needs met. FoodMesh is also a resource for organizations such as the Dan’s Legacy Foundation, which is always searching to source quality recovered food. Their partnerships with local food recovery movements have enabled community members to have access to items that are not commonly redistributed, such as poultry and seafood. As we move into 2018, Aunt Leah’s Place now has three food recovery partners to serve the community and grow sustainably. FoodMesh is proud to be one of the partners, contributing to support youth to eat well while living on a budget. Aunt Leah Place’s community has more access to a variety of foods, and they’ve found a way to increase and diversify their supply of food without compromising quality. Join FoodMesh at no cost. Food Recovery Hero of 2018!